Kasei Vallis is our topic for the weeks of April 18 and 25. Originating on the margin of Lunae Planum, the Kasei Vallis complex contains two main channels that run east-west across Tempe Terra and empty into Chryse Planitia. During the week of April 18th we will concentrate on the northern branch of Kasei Vallis. The week of April 25 will be devoted to the southern branch. The formation of Kasei Vallis is still being studied and several theories exist. It is thought that volcanic subsurfaceing heating in the Tharsis/Lunae Planum region resulted in a release of water, which carved the channels and produced the landforms seen within the channels. One theory is that this was a one-time catastropic event, another theory speculates that several flooding events occurred over a long time period. Others have proposed that some of the landforms (especially scour marks and teardrop shaped "islands") are the result of glacial flow rather than liquid flow. Teardrop shaped islands are common in terrestrial rivers, where the water is eroding material in the channel. A glacial feature called a drumlin has the exact same shape, but is formed by deposition beneath continental glaciers. This VIS image shows evidence of water flow long after the main channel was formed. The steep walls of the main channel have shed material covering the channel floor. Enough time passed for many craters to form prior to the incision of the final central channel. 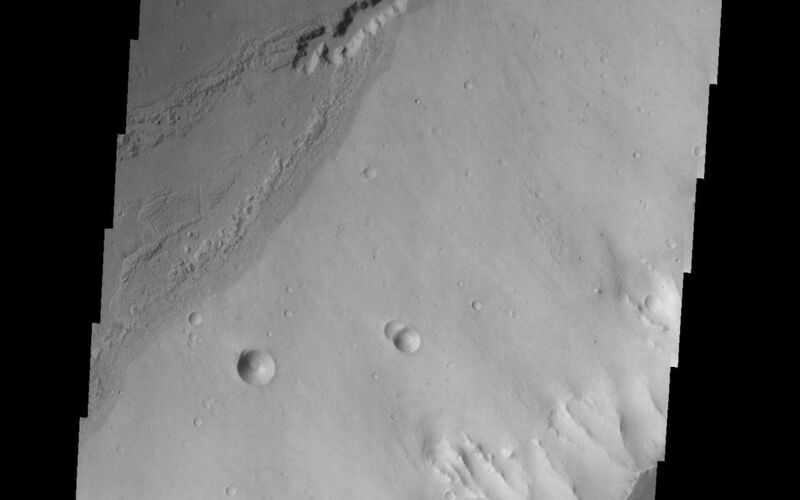 Note the small craters being erased along the rough margins above and below the small channel. Within the small channel the layers of deposit filling the main channel are visible. Image information: VIS instrument. Latitude 20.7 Longitude 287.4 East (72.6 West). 19 meter/pixel resolution.